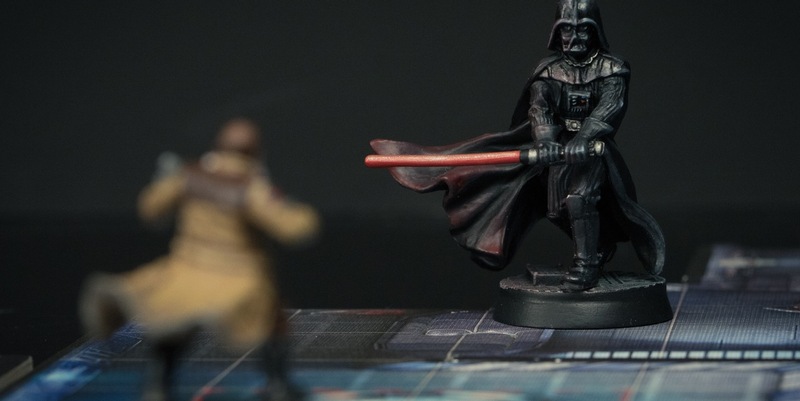 A painter who goes by the YouTube nom-de-palette Sorastro is gaining a cult following for his videos that demonstrate how to get Darth Vader just that right shade of Sith black. Sorastro is the by-night alter ego of Mark -- who requested we omit his surname out of deference to his current employers -- who cut his teeth painting Warhammer figures in his teens. Years later, he revisited the tabletop wargaming canvas, and realized he had a knack for teaching people how to paint, particularly in such under-appreciated mediums as zombies and characters from the Star Wars dice brawler Imperial Assault. Inverse chatted with Sorastro to find the key to unlocking his painterly charms: Is it the gentle authority of a British accent to our uncouth ears, guiding us toward a Chewbacca pelt that pops just so? Or is it the John Williams-inspired riffs that the painter composes to accompany his videos, which swell with each dramatic stroke? Or is it that we're just happy to see a galaxy that's a more vibrant and colorful place? How did you take the plunge into the world of YouTube painting tutorials? The first video I made was nearly two years ago. I'm not sure what prompted me to do it, really. I loved the planning, the shooting, the editing, the few bits of music that I did for that. When Imperial Assault came out, I just had to make a video. They're blank miniatures -- they're screaming to be painted. I've always been driven creatively, but in the last couple of years I've felt that need more than ever before. You started with two tutorials for Guillotine Game's Zombicide. What made you decide to pick up the camera? I'm not the most confident person by nature, but a couple years ago something changed inside of me, and I felt that I was able to produce something that would be of value to someone else. And I think that one particular product, the Quickshade, I had never used before. It gave such easy results, and I thought, "There are painters out there who have never picked up a brush before, I'm sure will be able to produce fantastic results just by following a few steps." With Imperial Assault, the feedback from that first episode was so terrific, and of course the view count was very impressive. The game contained so many individual figures or small units, and it lent itself well to that episodic delivery -- I could start with the troopers and then do the probe droids. If I put that stormtrooper video out and I got a couple hundred views out of it, I'd think that's very nice, but I don't know how many more I could have done. Because it does take about 40 to 50 hours to produce one video, and no one does that for no feedback or motivation. Those episodes were purely fueled by feedback. I also had the chap who did the AT-ST, Gordon Robb, introduce himself to me on my Facebook page. He also sculpted R2-D2 as well. And he was there trumpeting me to hurry along with the AT-ST tutorial because he wants to paint his own AT-ST. Walk me through how you spend those 40 or 50 hours. Where do you start? 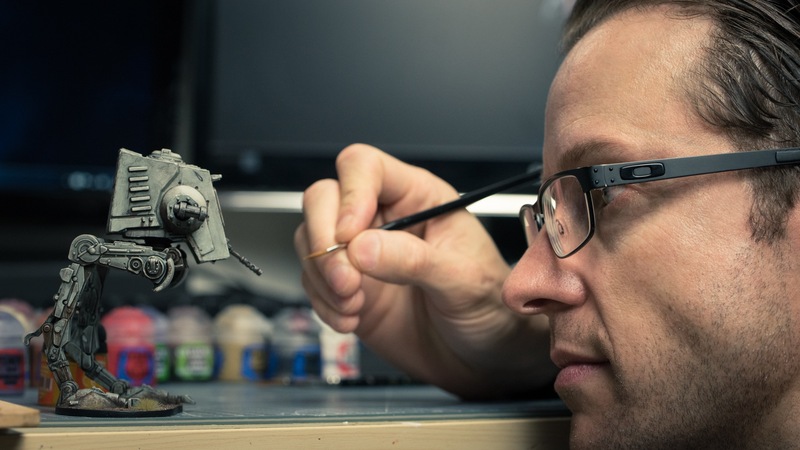 I sit down with a miniature in front of me and whatever reference material I need. In the case of one of the made-up characters in ['Imperial Assault'] like Gideon, who I'm doing at the moment, all you've got to go on is the character art. I'm not an expert on color theory -- it's just intuitive. You've got to be quite sensitive to what you actually see in the art and simply do your best to replicate it. Try various art forms on various spare minis, finding the easiest way to get the effect that I need, and also finding the easier way that requires the fewest number of paints as well. And that can take quite a few evenings, especially with a complex mini like Boba Fett. The characters from the films are a lot more difficult because if you're looking at the stills, the colors will vary from scene to scene and because of all the color grading they apply. With a famous miniature, everyone has the colors in mind that they think it should have. It's almost impossible to please everyone with the colors you pick. For those iconic characters, how do you get to the point where you're convinced the colors you choose are correct? Finding the best source images I can. So those shots from the movie are really well-lit. Like there's a scene where Boba's talking to Vader, for example, there's a nice well-lit closeup up his torso and helmet so that was quite an important image for me. It's also a question of deciding what it is about the color that excites or engages. 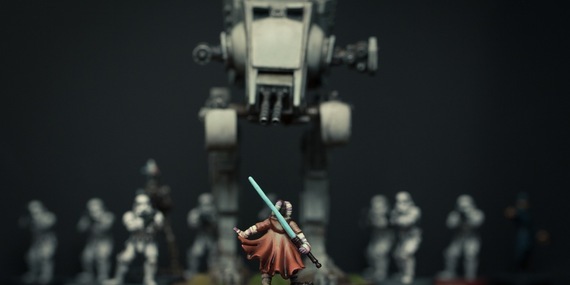 Or what particular part of the miniature really sells the look of the character and for Boba Fett it's that green on his helmet. I knew it really had to be right. Not too garish, not too bright, but not too dark. It's got a slightly turquoise faded look about it. So being sensitive to what makes that color so unique, it's important. And then it's a question of playing around with different combinations to get a color that closely matches that look. Sometimes it's obvious. One look at the character and you know it's got to be right. For Chewie, obviously, it's the fur. It's the characteristics like the dark patches in the fur that are unique to Chewie. You've got to really emphasize this, not make it look like uneven shading, but a deliberate design choice. All of these colors were deliberately designed by the filmmakers or the character artists, and they know what they're doing. If the character artist throws a little purple tint in the hair, that's there for a reason. It's because it works aesthetically. You compose your own music in the videos, is that right? This is all a one-man operation? Yeah, absolutely. It's just me with my computer and a little mini keyboard. Music is the one thing that I am trained in, so doing my own music was the obvious thing to do. Star Wars, of course, has such a large musical component that producing a video that covers Star Wars miniatures just begged to have some thematic music to go along with it. I'm quite absorbent as a listener of music. I can fairly quickly get what's going on in a piece or what the stylistic fingerprints are of a particular piece. When I sit down to compose my own, I can then draw on that assimilated knowledge. John Williams, for example, likes to use lots of mediant chord relationships. That's a nice, easy feature I can borrow to invoke that Star Wars feeling. Could you envision this becoming more of a professional-type gig for you? Absolutely. If my Patreon campaign continues to grow at a similar rate to as it has done, that will happen. I'm hoping next year at worst, I will be able to negotiate part-time hours in my day job, which would then allow me to double my output so I could produce one video every two weeks. And ultimately if I get to the top of the milestone in Patreon, I will be fully self-employed, and I will produce a video each week. Which would just be truly life-changing for me. I'll be such a happier individual when I'm able to just make a living being creative. So yeah, that is the dream. Why Did I Buy This Frickin' Star Wars BB-8 Toy?